This article first appeared in Capital, The Edge Malaysia Weekly, on March 12, 2018 - March 18, 2018. AND the winner at last Sunday’s 2018 Oscars, Hollywood’s 90th annual Academy Awards gala, once again was not Tinseltown’s legendary big stu­dios, but tech players such as Netflix, Hulu, Amazon.com, Apple, Google’s YouTube and others who are upending the movie and TV business with their own original video content. In recent years, the big winners at award galas such as the Golden Globes and Oscars have been Amazon, Netflix or Hulu rather than Walt Disney Co, Sony Corp’s Columbia Pictures, Viacom’s Paramount, 21st Century Fox, Comcast Corp’s Universal and Time Warner’s Warner Brothers. 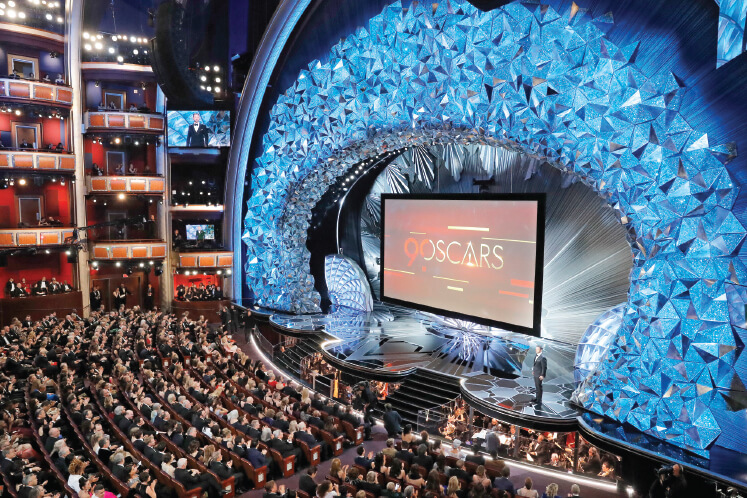 The Academy Awards may no longer enjoy the massive ratings they once did — the March 4 audience was 20% lower than last year’s awards — but it is still one of the most talked-about shows globally. And while Amazon did not have as good a night as it did a year ago, when its films were nominated in seven categories, Netflix had eight nominations and won one. The video streaming pioneer’s shareholders may not have helped boost Oscar’s viewership, but they were clearly applauding the next morning by sending its shares skywards. In two trading days following the Academy Awards, Netflix, already the highest-flying large-cap stock this year, surged 8%. Netflix stock is up 70% in the first nine weeks of this year, 162% since January last year and a whopping 3,842% since September 2012. To be sure, how, what and where we watch filmed entertainment today are different from just a few years ago. Cinemas or flat screens on the wall are no longer the preferred medium now that we have tablets and smartphone phablets as well as laptops, among other devices. From who makes video content to who distributes it and how, the entertainment business has been dramatically transformed in recent years with over-the-top streaming. Take The Big Sick, a romantic comedy about Pakistani-American comedian Kumail Nanjiani, whose relationship with his white American girlfriend is nearly derailed over cultural differences and a medically induced coma, which was nominated for Best Original Screenplay. It was a small US$5 million budget indie movie for limited release. But Amazon Studios bought the distribution rights for about US$12 million. Instead of releasing it just on its own Prime streaming service, Amazon put it out in theatres worldwide, where it earned more than US$60 million in revenues. Unlike its archrival Netflix, ironically for a streaming player, Amazon is a big proponent of the theatrical experience, with many of its films getting at least some kind of theatrical run. The common thread in US tech darlings FAANG — Facebook, Apple, Amazon, Netflix and Google’s owner Alphabet — is they all see videos as a key growth driver. China’s tech trio BAT — Baidu, Alibaba Holding Group and Tencent Holdings — share their US counterparts’ love for videos. Tech firms collect massive amounts of data about us and use algorithms to dish out what we want to watch. Buoyed by investors’ enthusiasm for Netflix, tech giants are testing shareholders through more listings. Alibaba has a listed film production subsidiary in Hong Kong and, last week, Baidu’s video-streaming service unit, iQiyi, filed for an IPO seeking to raise up to US$1.5 billion in New York. Analysts have valued iQiyi, a Net­flix-like streaming service that has more than 50 million paying subscribers and more than 420 million mobile monthly average users, at up to US$17 billion, although the firm lost US$592 million last year and is unlikely to turn a profit for at least two more years. Tencent is expected to list its music-streaming subsidiary later this year and video unit next year. The money that tech players are raising from listings and bonds, or by bringing overseas cash home, will come in handy in the ongoing arms race for video content. Netflix plans to spend US$8 billion on original content this year. Amazon is expected to spend more than US$6 billion this year (up from US$4.5 billion last year) on video content and take its annual spending on video content beyond US$8 billion in two years. Hulu spent US$2.5 billion on originals last year and is expected to spend US$3 billion this year. In comparison, the BBC spends just US$1.4 billion on new video content. And Disney’s sports channel ESPN’s total content budget, mostly rights to sporting events, is US$7 billion this year. Netflix has signed star producers Shonda Rhimes and Ryan Murphy to nine-figure deals; Amazon has pledged more than US$200 million towards a Lord of the Rings series. Netflix plans to offer 700 original shows and 80 original movies by year-end to help add subscribers to its platform. That may sound like a lot of content, but Netflix now makes original programming not just in English for American and global audiences, but also produces content in Spanish for Latin Americans, Hindi for Indians and Arabic for people in the Middle East, among other languages. Not long ago, Netflix, reliant on the archives and libraries of big studios, was considered vulnerable in case Disney, Time Warner, NBC Universal or Fox someday pulled their content. Now that Netflix has plenty of its own popular content such as House of Cards, Orange is the New Black, Stranger Things, Black Mirror and Riverdale, it does not really need to show old movies from other Hollywood studios. Netflix subscribers say they watch it mainly for its originals, with the old library being just the icing on the cake. Yet, Netflix and Amazon are now bracing for some serious challengers in the space. The biggest one is Apple, which has a cash pile of US$285 billion. Apple has a stated goal of doubling its services business to surpass US$50 billion a year by 2020 as it tries to reduce its reliance on hardware such as iPhones, iPads and the Apple Watch. Apple has already announced spending of US$1 billion on original video content this year and is likely to spend more. Last year, it poached Sony Pictures co-presidents Jamie Erlicht and Zack Van Amburg to lead its push into streaming. Apple is currently filming a new 10-episode TV drama series starring Reese Witherspoon and Jennifer Aniston. The iPhone maker also has a deal with Steven Spielberg to revive his renowned 1980s television hit Amazing Stories. So far, of the major players, only Google has yet to show its hand on big original content spending. Its YouTube Red streaming service budget, said to run into the hundreds of millions, has not been increased this year, which has led to speculation about whether Google has something up its sleeve such as a major acquisition of a movie studio. YouTube’s free video site generated US$15 billion in advertising sales last year, but Google wants to make money from expanding YouTube’s paid-subscription sites. Facebook too has talked up its video ambitions in recent years but has yet to begin pouring in billions the way Amazon and Netflix have been doing. Still, the social media giant is wooing talent from studios to fast track its ambitions in video entertainment. It recently recruited the former head of BuzzFeed Studios to lead its global video content, together with an ex-Pinterest executive, to take the reins of Facebook Watch, a proprietary video content platform. Facebook and Google are keen on diversifying away from heavy reliance on advertising by adding stable subscription revenue streams from video. Another player is Hulu, which is jointly owned by Disney, 21st Century Fox, Comcast and Time Warner. With 17 million paid subscribers, Hulu is currently available only in North America but has made a name for itself with original content such as The Handmaid’s Tale, which won eight Emmy Awards and two Golden Globes (Netflix has more than 100 million subscribers globally, of which 53 million are in the US). It chalked up US$920 million in losses last year and is projected to lose US$1.67 billion this year. Although it lags behind Amazon and Netflix, Hulu is making up for lost time. It recently signed George Clooney for a six-episode adaptation of Catch-22; and Jason Blum, a producer of Get Out, which won an Oscar this year for a monthly horror anthology series. It is also producing The Looming Tower, based on the Pulitzer Prize-winning non-fiction book about the history of Al Qaeda and the run-up to the 9/11 terrorist attacks. Alibaba Pictures Group lost US$150 million last year but has vowed to invest another US$7.2 billion over the next three years in filmed content. It recently bought a US$1.24 billion stake in cinema owner Wanda Films. The biggest and most aggressive player on the video front in China is Tencent, which has nearly 500 million mobile monthly active users and more than 50 million paying subscribers. Tencent recently bought a big stake in Hollywood’s Skydance Media, which has a track record of producing and financing films that appeal to a global audience, including blockbuster titles such as Star Trek and Mission: Impossible. Tencent will help Skydance with marketing and distribution of films such as Star Trek in China. Yet, new movies and TV series from Netflix, Amazon and Hulu are unlikely to satisfy the appetite of all viewers. Around the world, viewers are saying “goodbye” to their expensive pay-TV “bundles” as they cut the cord to their cable companies. While severing ties with pay TV might get you cheaper programming options, you will miss out on live TV, particularly sports and local news. Both Hulu and YouTube launched their own live TV services last year. Apple pulled the plug on its own skinny live TV bundle with local TV station tie-ups when it realised that the path to profitability would be long and hard. It is now refocusing on just movies and TV series. Facebook too has its own live TV ambitions. The big shift in live TV is likely to come over the next three years when major TV sports rights are renegotiated. TV and radio rights for live sports programming generate more than US$18 billion a year in the US. Most of the live US TV sports rights, including Major League Baseball and Monday Night Football, start to expire between end-2020 and 2022 and will be renegotiated. Amazon, Facebook and Google are said to be eager to snap TV rights away from Disney’s ESPN, Fox and NBCUniversal. Amazon broadcast Thursday Night Football on Amazon Prime last year and Facebook Watch has shown both live sports and other sports-related content. Google’s YouTube TV now has the exclusive regional broadcast rights to Major League Soccer team Los Angeles Football Club, for which David Beckham once played. As pay-TV subscribers cut the cord and switch to Netflix, Hulu and Live TV from Facebook, Apple or YouTube, content providers and studios are turning to streaming their stuff direct or turning their service into an app on your phablet or tablet. Disney will launch two separate streaming services of its own next year; HBO, CBS, Viacom and Fox News will soon start directly streaming most of their programming. That is the way it should be. Pay-TV, with hundreds of channels, became like a vastly expensive buffet. We all like a huge variety of food laid out but balk at paying exorbitant prices when we know we are really not going to eat much. Now, streaming and apps are providing us with a better way — limited selection from the buffet table at affordable prices. Next up? Mergers. With their huge cash hoard, Apple, Google and Facebook, which can now bring back their overseas cash to the US at a low tax rate, are likely to use that to buy a Hollywood studio. AT&T’s Time Warner deal is on the brink of collapse; Fox’s entertainment assets are already in play, with Disney and Comcast bids and counter offers on the way; under a new CEO, Sony is ready to jettison its own Hollywood assets and, indeed, Disney and Viacom might themselves be targets for Apple, Facebook or Google. Why spend billions building something when you can just buy it? The future of video is clearly in the hands of FAANG, not Hollywood. Next year, or the year after, I will probably watch the Oscars on Facebook or through an app on my iPhone or iPad.